The Australian government has ambitious plans to protect the Great Barrier Reef, but it could do more, says a former government official. The former head of the Great Barrier Reef Marine Park Authority (GBRMPA) is calling for a halt on the construction of new coal mines in Australia to prevent further damage to the reef. Graeme Kelleher served for 16 years as the first chairperson and chief executive of the GBRMPA, a government organization. The call to halt new coal construction comes days after the climate talks closed in Marrakesh, Morocco. The Australian government faces a Dec. 1 deadline to report back to UNESCO’s World Heritage Committee about its handling of the Great Barrier Reef’s health. The Australian government claimed in September that it made good progress in protecting the Great Barrier Reef during the last year. But 22 percent of the Reef’s coral were killed last month from coral bleaching, the worst coral bleaching event in history. The Great Barrier Reef, along with others, was also affected by a major global coral bleaching event last year. About half of the Great Barrier Reef was affected, and up to 90 percent of the corals are bleached in some individual reefs. Since March 2016, the sea surface temperatures over the northern Great Barrier Reef hovered around 1 degree Celsius above the recent long-term average, and some areas have higher temperatures. The bleaching event is ongoing. Released in March, the Australian’s government’s Reef 2050 Plan is a joint, self-proclaimed “ambitious” plan by the Australian and Queensland governments to protect the Great Barrier Reef. The Reef contains a maze of smaller reefs and islands that stretch over 2,300 kilometers on the Queensland coast. 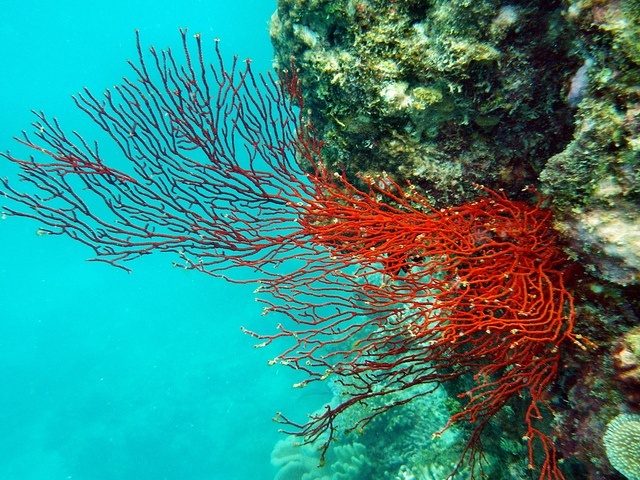 Its biodiversity is incredibly rich and contains everything from mangroves and seagrasses to coral reefs and open waters. Both the Australian and Queensland governments will invest $2 billion (Australian) over the next decade. And in 2015, the Australian government announced it will establish a Reef Fund under the Clean Energy Finance Corporation that will provide up to $1 billion (Australian) over 10 years in investment finance for projects in the reef catchment region that provide clean energy, reduce emissions and improve water water quality. While the Australian government has promised to protect the Reef, it also granted approval to a big expansion of the country’s coal mining last year, including the Carmichael coal mine in Queensland, the world’s largest new coal mine. The Carmichael mine’s annual emissions of 79 million tons of carbon equivalent (C02-e) will be greater than those of Paris, New York City or Tokyo, according to a 2015 report by the Australia Institute. That amount is also comparable to annual emissions from some countries, including Sri Lanka, Malaysia, Austria and Vietnam. It will be the biggest coal mine in Australia’s history, and is expected to produce 4.7 billion tons of CO2-e over its lifetime, which is over 0.50 percent of the world's carbon budget for limiting warming to 2 degrees Celsius. The emissions from the mine will “entirely offset” Australia’s carbon emissions reduction goals. It will also offset four-fifths of Canada’s carbon-reduction goals and half of Japan’s goals.